← A Wicked Problem. A Wicked Solution? You probably get a lot of letters from both admirers and those seeking to criticise every facet of your existence. I am one of the latter. You might recall I’ve written to you before. Last time I wrote I told you about how concerned I was that you weren’t getting proper scrutiny in the mainstream media. Thankfully, since the recent change in ALP leadership, the media seem to have moved past their obsession with Julia Gillard. And in want of something else to write about, some of the more scrupulous journalists are taking some interest in your plans for the country and your behavior in trying to achieve your ambition to be the next blue-tie-wearing Prime Minister of Australia. The introduction of the Guardian’s local edition has helped this happy scenario come about. Just in the last few days, Margo Kingston revealed your lies about using Comm cars for private travel while promoting your book Battlelines. I’ve also seen an article about your Direct Action policy by Lenore Taylor, Jonathan Swan from the SMH has taken an interest in the Ashbygate Trust and Chris Uhlmann asked you some direct questions about your ‘stop the boats’ policy on ABC’s 7:30. Did I say policy? Apologies, I meant slogan. All of this scrutiny no doubt makes for an unhappy week for you, which I’m not ashamed to say makes for a very happy week for me. It’s clear you’re under a bit of pressure, what with your cowardly decision to turn down a debate with Kevin Rudd and this behavior in your pie stacking press conference was just, well, I don’t know what it was Tony? But the reason for my letter is not to make your week any worse, although that would be a welcome side effect. No, I’m writing to you about your crumbling personal character and policy platform which is quite clearly a house of cards, built on quick-sand foundations. You see, the thing is Tony, when I stand back and look at what you spend 95% of your time in the media saying, it’s pretty clear to any objective outsider that you’ve set yourself up to fail. And it’s quite clear why you can’t possibly risk debating Kevin Rudd at this point in time, because you know as well as I do, if you’re really honest with yourself, that your house of cards could come crumbling down at any moment. Because it’s basis is a massive pile of dishonorable, weasel word, downright misleading and dishonest sloganeering and smear. This is what you have built Tony. And I think it’s time you realise just how dangerous a position you are in. It’s all been so easy up to now. It’s no surprise that you’re suffering from the worse kind of complacency. The complacency of a man who hasn’t had to defend his own positions. Who hasn’t had to compete on a platform of ideas and intelligent debate about the merits of your alternative plans. All you’ve had to do for the last three years is to call Julia Gillard a ‘liar’ and your work for the day was done. How easy you must have thought life was. How weak your brain muscle must have got over all this time while you leisurely went about your business, doing stunt after stunt on your anti-Carbon-Price-Convoy-of-No-Charisma, spending hundreds of thousands of dollars of tax-payers’ money on your never ending election campaign, while paying little or no attention to the policy success of your rivals in the government. And while paying little attention to the merits of what was coming out of your mouth. Yes, I’m talking about the merits of what you have been talking about for the last three years. Because the fact is, while you’ve been using your Murdoch-inspired media pack to convince the Australian public that Julia Gillard can’t be trusted, the real truth has been that your entire policy platform, your whole view of the world, is so easily unpicked that you literally will not risk being asked any questions about it. It’s as flimsy as your claim to have ‘no specific knowledge’ about the Slipper/Ashbygate scandal. But know this. We can see right through you Tony. And right through your cheer squad of angry Abbott supporters who scream and yell on the radio, write misogynist blogs and troll #auspol. If you were an emperor Tony, you wouldn’t be wearing any clothes. But you’re not an emperor. And your supporters have no logical argument for why they support you. Because the truth is, they have absolutely no reasonable way to defend your policy positions, except to admit the one thing they, and you, will never admit. And that is that your slogan policies aren’t based on intelligence, truth and respect. Let that settle for a second Tony. Intelligence. Truth. Respect. When you say ‘stop the boats’, you deny the complex problem of displaced, scared, desperate people looking for some way to save their lives. When you say Labor is all about debt and you spread economic doom and gloom around the economy, you deny the Global Financial Crisis and Labor’s success in steering the country away from recession. When you say ‘axe the tax’, you’re pretending the problem of climate change is not important enough to make sacrifices for. And you think short-term opportunism is more important than the lives of future generations of earth’s inhabitants. When was the last time you, or any of your LNP colleagues, showed intelligence, truth and respect? I can’ think of a single instance. Because let’s be frank Tony. There’s a reason why weasel words are your only option. You’re only interested in helping a very small percentage of the Australian population. The minute anyone examines your slogan policies, this truth is revealed like budgie smugglers tearing open in the surf. The reality is, you’re the enemy of the working people you stand next to at your countless factory visits and anti-carbon tax rallies. You cosy up to them as if you’re backing them all the way, when really you would happily destroy their prosperity, their stability of employment, the infrastructure they need, their access to government services including health and education, if you thought there was a buck in it for your rich mates. Everything you say and do is designed to both fool people that this is not your true purpose, and to reassure those who know you are only supporting them that you will continue to do this. Please understand that when I say you only care about Gina Rinehart and Rupert Murdoch, I’m not saying you literally only support two people. I’m talking about Rinehart, Murdoch and the people who are like them; those who aspire to be as selfish, ruthless and rich; those who fantasize about a world where the Rinehart/Murdoch philosophy is acceptable and success is measured by how like-them you are. It’s a disgusting aspiration Tony, and you should be embarrassed to be encouraging it. As soon as this fact becomes more apparent to the electorate, as soon as they realise how abhorrent your world view is, you’re done Tony. Because I believe Australians are better than this. While you’ve been aiming for the lowest common denominator, you’ve been underestimating that Australia is a community. Not an economy. The economy serves the community, not the other way around. Your house of cards will come tumbling down as soon as this simple truth is more widely acknowledged. I just hope this happens before the election, and not after. Another good one Victoria, plunging straight into the weasel’s jugular veins. Stop the Boats and Turn the Boats Around are just some of those twisted dribble flowing from the biggest con artist Australia has ever seen in our history. Tony Abbott will never be able to Stop the Boats. Based on facts of law and I cannot wait until those marked cards dealt from the bottom of the leaking deck sink between the waves. JamesH, he’ll never Stop The Lies, either. For that reason I kind of hope they keep him. Either way he is shortly due for the dustbin of history. Well sais Victoria and Frank! “Empty vessels make the most sound” and the next sound Tony Abbott will hear will be the ‘gong’ from the Australian people: time up! Why would people support? ‘He’s not Julia’! Well now that she is gone, are there any other reasons? Apparently not. A mouth filled with teeth, framed by a smile, is not good enough to become Prime Minister. Go Kevin: thank you Julia for all you hard work! Well said. I hope this gets as wide a coverage as pictures of Mr Abbott in his speedos/hardhat/ yellow coats. Thank you for articulating so clearly why Abbott is unfit for PM. Great piece again! Abbott is a coward. No vision for Australia other than helping out his rich mates in the hope he will be rewarded for his efforts. Such a fool these people will drop him like a hot potato as soon as they get what they want. Australia cannot afford Abbott! He will set us back 50 years. Think before you vote! Tell us what you REALLY think!!! I am a self funded retiree. I have always been a swinging voter since the days of Fraser & Whitlam. 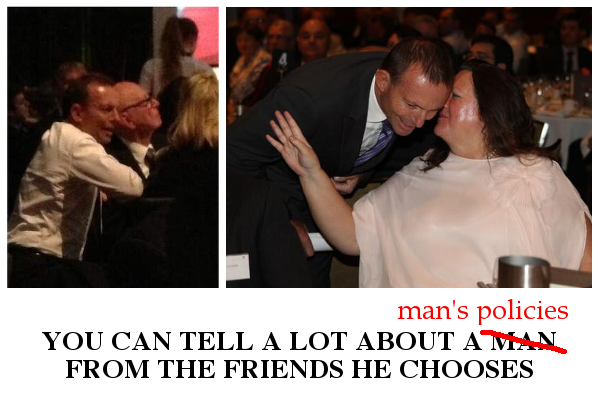 In my circle of friends, family & acquaintances I know nobody who respects Tony Abbott. This includes people who are confirmed Liberal & Labor voters. Even when I sit in the “old man seats” at my local Westfield whilst waiting with all the other old blokes for our wives, I never find anyone who respects Abbot. Even my adult children who are Liberal voters do not respect him. I think that it is the lack of respect for Abbott that is key to all this. I have no doubt that he is quite OK on a personal basis & his community activity (although vastly overstated by News Ltd) is worthy. The comment that I hear most about him is usually something like “I just can’t imagine this dill as Prime Minister” Voters need someone in the office that they can respect & trust to be a stable reliable representative of the country, not someone that makes you cringe when he tries to express himself. I don’t think we necessarily have to like our PM (Hawke & Keating come to mind) but respect is important & I just don’t see respect for Abbott in the community. Having said all that though, I still think the LNP will win the election mostly on the basis that the electorate yearns for stable majority government after the last three years & I do not think voters think that Labor can deliver this in the short term. However, we shall see. Well done,you really hit the nail dead centre with this letter and it should be read by as many people as possible. You have laid out your views in a precise and rational way,something the other side could never do. I dont have the chops to write and articulate points like you can,so thanks again for this letter,and with people like you on board Abbott and his cohorts will be defeated. It’s the workers who put them into power and the workers who kick them out. I feel that Bunny Abbott’s time has come ?? He only became Primoe Minister by one vote,that does not give in a manate to do anything, wait! He knows that because his not doing anything.He beat Mr Turnbull by one vote to become Australia’s dumbest PM,sorry again I had better write that in full or he won’t know what it means (Australias dumbs Prime Minister),oh well a least we seeing quite a bit of comedy with Abbott,Morrison and Bisholips. Looks like Abbott’s tow the boats back has ran aground off Indonesia. blog? My blog site is in the very same niche as yours and my visitors would genuinely benefit from a lot of the information you present here. Consider that all these jobs don’t need to be done all together all at once. one bottle of it so I may have had a bad batch. reading this eormous article to improve my knowledge. Hurrah! At last I got a blog from where I know how to genuinely take helpful information concerning my study and knowledge. subject? I’d be very thankful if yyou could elaborate a little bit further. high ranking directories which can yield precious links, so that you can achieve the best outcome for the time and effort invested. up-to-date on what is going on in your organization. Good information. Lucky mme I ran across your site by chance (stumbleupon). suis poste dauxiliaire de maison de retraite maison de retraite. sniffing technique for Pc, MAC, IOS, Android and Blackberry. the reason why I can’t join it. Is there anyone else getting identical RSS problems?